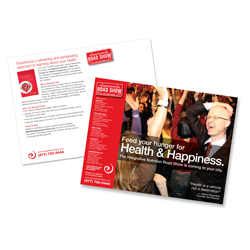 When the Institute for Integrative Nutrition needed an attention-grabbing postcard and emailer to announce a cross-country roadshow, they turned to Kat Georges Design. We started by developing a "Road Show" logo to tie various elelments of the project together. We helped with copywriting, developed graphics for front and back of postcard, supervised printing and handled the html to get it into an emailer format.